Whether you are taking your workouts outdoors or are ready to try something new with your fitness regimen this spring, staying motivated to keep on track with your workouts will be one of your biggest challenges. The warmer weather can make it easier to head outside and enjoy some fun workouts in a new environment, but you may need some extra motivation to keep yourself on track and avoid temptations as we move in to the warmer weather. 1. Change up your cardio routine – if you are starting to get tired of your winter cardio workout routine, take advantage of the warm spring weather to shake up your routine! Take it outside with brisk walking or jogging or take your workout to the park. 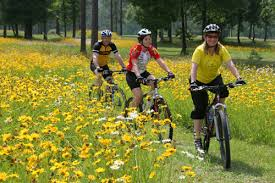 Dig out your bike for a change of scenery or find an outdoor fitness class to provide you with a new challenge. 2. Bring back the buddy system – whether you participate in a group activity or just find yourself one dedicated workout buddy, working out with others is a sure way to keep you motivated! Plan a time and a place to meet your group or buddy for a walk, run, bike ride or group workout. Having someone hold you accountable may be just what you need to stop skipping workouts. 3. Turn up the tunes – the right type of music can help you to stay motivated and will keep you focused during your workout. Change up your playlist with some spring and summer upbeat tunes to keep you in the zone. 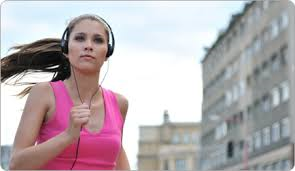 You will find it easier to push through the hard parts in your workout when you are lost in your favorite tunes. 4. Do it anyway – if you are not feeling like working out, commit to yourself you will give it at least 15 minutes and then re-evaluate. You will find that once you push yourself through those first few minutes, you are likely to continue on and get that workout in. If you still are not feeling up to it after the 15 minutes, at least you have gotten in a short workout and you can tackle it again tomorrow. 5. Try a “HIIT” workout – Short on time? Try a High Intensity Interval Training workout. 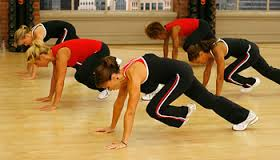 HIIT training is a great way to boost your metabolism for hours after your workout and can mix things up to avoid boredom. Rather than skipping your workout all together in favor of laying in the sun, increase the intensity and shorten the duration of your workout so you can get in and out of the gym in faster time. 6. Remember how far you have come – If you are thinking of skipping your workout, take a minute to think of how far you have come. If you have made tremendous gains in your strength, endurance and overall fitness over the winter months, they can be quickly lost if you start skipping your workouts. Focus on all of the gains you have made and carry on with the good work so you will not be starting back from scratch when fall rolls around again. 7. Think how good you feel – Think of the high you feel after a good workout no matter how hard it was to get started! There is no better sense of accomplishment then knowing you have completed a great workout especially when you did not feel like it to begin with! Harness the power of your mind and step in to your sneakers – you will be glad that you did! 8. Get the family involved – Kids home for the summer? No problem! There are lots of ways to get out and be active with the whole family while enjoying fresh air, exercise and time together! Bring along the family dog and head for the park. Not only will you be getting some great exercise, you will be teaching your kids that working out can be fun! 9. Sign up for an event – A sure way to stick with your workout and stay motivated is to sign yourself up for an event. Whether it is a charity walk, a fun run or a challenge such as a tough mudder or amazing race, you will be sure to have a good time while staying on track with your fitness program in order to train for the event. Round up your friends, family or co-workers and sign yourself up for a summer event that will keep you working towards your goal throughout the spring. 10. Have FUN! Find activities that you love to do and they will never feel like work! 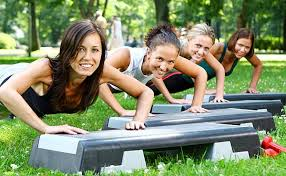 Whether it is the group fitness class that you look forward to each week with a group of friends, getting out and enjoying the great outdoors and taking part in another activity that you enjoy, you will never feel like you are working hard as long as you are having fun! So get out there and find your passion – you will be glad that you did!